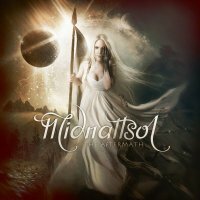 Seven years after their last album, 'The Metamorphosis Melody', German/Norwegian's Midnattsol have returned with just original members vocalist Carmen Elise Espenæs and keyboardist Daniel Fischer intact, alongside guitarist Alex Kautz who débuted on 'The Metamorphosis Melody' because bassist Birgit Öllbrunner, drummer Chris Merzinsky, and long-time guitarist Daniel Droste all departed the band last year - hence the album title? Joining the band for this new album is ex Ahab, Endzeit and current Stillborn bassist and guitarist Stephan Adolph, and Espenæs's older sister, the renowned ex-Theatre Of Tragedy and Leaves' Eyes vocalist Liv Kristine Espenæs. Although it is unclear who drummed on this release, Midnattsol are using Adolph's Stillborn bandmate Michael Kapelle for touring duties, so he may well have had a hand in this recording. With Carmen being the main lyricist, and rooted in traditional Nordic folklore, as is her sister Liv, the stronger emphasis this time out is towards Folk. The sombre traditional mediaeval Swedish ballad (as covered by Coronatus, Haggard, In Extremo, Garmarna, Othalan, Alsuna and Tibetréa amongst others) 'Herr Mannelig' is a case in point. This epic nine-minute plus song will be particularly familiar to their Scandi fanbase. 'Syns Sang' and 'Eitrdropar' (old Norse for "Drops Of Venom") are steeped in Nordic mythology; the former full of dramatic riffs and pounding drums, whilst the latter attributed as a bonus song and very short and folky to boot. Again, 'Forsaken', written by guitarist Kautz, who also has a penchant for Folk music, and is about the last survivor of mankind after nuclear devastation weaves string elements around the folkier strands of the song. Another traditional Swedish folk song 'Vem Kan Segla' ('Who Can Sail') combines the lilting harmonic voices of the sisters, who complement each other throughout this album, with Carmen leading the way and Liv embellishing the melodies and lyrical harmonies. With so many traditional and ancient Norse songs abounding in Midnattsol's repertoire it's interesting that they bring us right up to date with a song about the Utøya Island massacre by the far-right extremist Anders Behring Breivik. 'Ikje Glem Meg' ('Do Not Forget Me') is a mid-tempo rocker sung in Norwegian. Fans of Midnattsol will still endorse their slight change of direction, but whether the band are able to tap into the wider Gothic and Symphonic audience may well rest on the attraction of Liv Kristine into their ranks.